More than one century has passed since the introduction of "newspapers" in Japan. Besides its main purpose to transmit information, newspapers are widely used on daily basis, and there are also many ways to "reuse". However, "Shimanto newspaper bag" makes a clear distinction between conventional "reusing" method. It all started based on a grand concept to "wrap every product sold in Shimanto river region in newspaper" with environmental conservation in mind, and was realized by the residents who got together to give ideas to use newspapers effectively. Essentially, this was not thought up of as a "product", and it can be said that the most important thing is "the concept regarding production". Pursuing the question "what is a sustainable society" as a community activity, and going back to the basics of ecology; in other words, rethinking the cycle of things and submitting to educate the others is the mission of the bag. 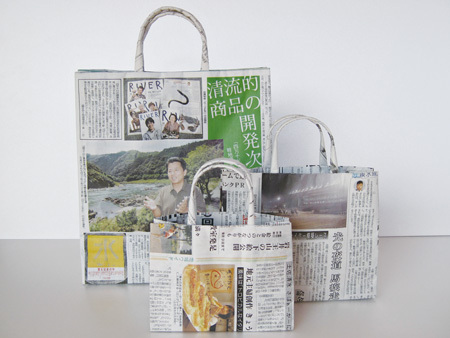 In present days when there is a trend for fashionable "my-bag" and eco-bag, "Shimanto newspaper bag", which doesn't require scissors and formed only by folding newspapers and gluing together, is starting to gather worldwide attention as an unprecedented ultimate eco-product. Great things can be expected from future activities.